One of the things I’m often asked is what do analysts actually do? The answer depends on what kind of analyst you are talking about. Generally, industry inquiry analysts are brought in to answer questions on a variety of subjects having to do with the market, what customers want, what has historically worked, and to help strategize about competition. In many cases we effectively replaced competitive analysis departments with an outsourced shared resource. This is often desired because our being outsiders means we are less likely to either be corrupted by company bias or become afraid to tell the truth due to fears about our careers. One of the tools we use, though not as often as I’d like, is the competitive assessment. This is where we take the publically known attributes of a product and compare it to its competition. This was most commonly done using something called SWOT, Strengths, Weaknesses, Opportunities and Threats followed by a recommendation. I thought it might be interesting to do an abbreviated version of one against the current presidential candidates. Let’s look at Trump vs. Clinton SWOT this week. Now, before we start, let me point out this would typically be a summary of a longer report and/or tied to a presentation where the analyst would defend the points and answer questions. But this should give you a sense of how this might be done. The goal of this is not to create a definitive competitive document but to showcase how you’d break down the analysis. Clinton: Decades of experience both in and around the job and with regard to politics in general. Strong public speaker, ex-president as husband, strong financial support from a variety of sources, appeals to woman in particular. Very strong minority support. A scrapper and not afraid of a fight. Trump: An accomplished CEO, deadly on social media, particularly strong on the attack. Charismatic public speaker, strong brand management, a billionaire (could self-fund), appeals strongly to those most likely driven to vote by fear. Able to own a news cycle better than most. Clinton: Under her husband’s cloud, massively distrusted, thinks tactically not strategically, tends to drop into a rut. Not particularly charismatic. Not willing to take big risks. Tied tightly to Wall Street and other private interests (good for funding bad for image and primary demographic). Doesn’t appeal to those that want change. Trump: Tends to speak without thinking, highly reactive (could be easily manipulated), appeals to relatively narrow demographic. Alienates large numbers of people needlessly. Doesn’t appear “presidential.” Lies needlessly and excessively. Tends to drift off message, a lot. Disruptive in a scary way. Lack of political experience. Poor fund raising, poor impulse control. Clinton: First woman president, a sense of making history. Nurturing image would contrast against Trump’s exclusionary position nicely. Has ex-president as a primary advisor. Appeals strongly to those who don’t want change. CEOs are often not trusted by blue collar workers. Trump: Clinton nomination appears fixed, Clinton email scandal appears fixed, a constant focus on Clinton being given/stealing the election is a huge opportunity to disenfranchise voters. People won’t vote for politicians they don’t trust, or that are owned by others, suggesting large numbers of Clinton’s party may not vote with proper demotivation. Clinton: Untimely disclosures of questionable past decisions or deals related to her tenure or getting the nomination. Husband’s behavior/history. Overconfidence. Bernie Sanders. Donald Trump suddenly pivoting to the middle, or manipulating Clinton into a big mistake. Bad VP pick. Trump: Elizabeth Warren (her attacks have been particularly effective, and Trump has been ineffective against her). Twitter + Tweeting without thinking. Untimely disclosure of a damning business practice. Republican Party. Bush family. News services. Overconfidence. Clinton suddenly becoming strategic, or a Clinton supporter manipulating Trump to make a big mistake. Massively underfunding the campaign. Bad VP pick. That actually isn’t the purpose of this exercise. It is to point out to a product owner what parts of the solution needs to be fixed, what threats need to be mitigated, and what parts need to be supported and not broken. It forms the basis of a strategic plan. If you build a plan without doing this, you end up either screwing up something that didn’t need to be fixed or not addressing something that does. By the way if you match the threats to the weaknesses you tend to highlight the things you need to fix first. Now on paper Clinton is sure to win. She has the money, the experience and her party is behind her. However, Brexit showcases that with a populist event you can pretty much throw the “on paper” conclusions out the window. So I’d put it this way, if Clinton can correct her trust issues with voters, keep Bill from creating another scandal, and get those voters motivated to vote, she can’t be beat (head to head, with equal turn out, she has more voters). If Trump can stop his unforced errors, pick a VP that can offset Warren but still appeal to the middle, and make Clinton look even more untrustworthy (so a critical mass of her voters stay home) his win will be certain. Depending on who I was doing this report for, that would basically be my recommendation. 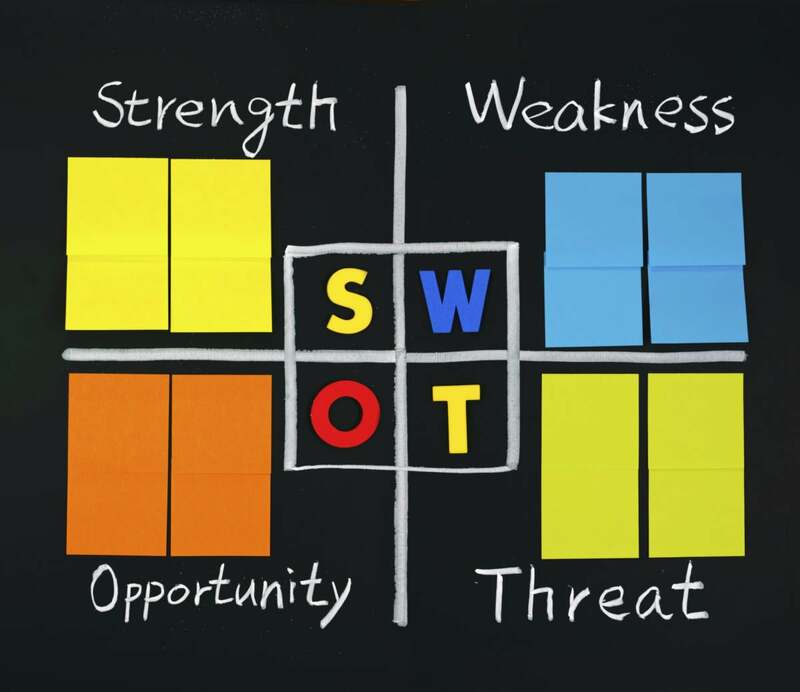 And that is basically how you do a SWOT analysis. What do you think?